CLEARWATER, Florida -- It's supposed to be a big year in the Kingery family, and father Tom knows as much, even if he chooses his words carefully. "We think so," he said. "Well, we hope so. We'll see." Tom's son, Scott Kingery, enters 2018 as the Phillies' No. 2 prospect and No. 35 overall in MLB.com's rankings. The 23-year-old second baseman is coming off his best season as a pro, having hit .304/.359/.530 with 26 homers and 29 stolen bases at Double-A Reading and Triple-A Lehigh Valley. He's carried that success to Grapefruit League play, leading the Phils in hits (seven) and homers (three) as a non-roster invitee. Though he's blocked by Cesar Hernandez at the keystone, he's looking to make the Phillies think long and hard about finding him an Opening Day roster spot. Yet his father, who's down in Clearwater for the week, spent most of Wednesday not on the Major League side at Spectrum Field but next door at the Carpenter Complex. Part of it was he knew his son wouldn't be in the primary or secondary lineup for the Phillies' Grapefruit League game against the Red Sox. Also, he wanted to check in on Luke Leftwich and Tyler Viza, two pitchers he coached from their days back in the Ahwatukee Little League program in Phoenix. The Phillies system had four Ahwatukee alums in its pipeline in late 2016 before Joey Curletta was traded to the Mariners. "We sent a picture of all four to [director of player development] Joe Jordan," Tom Kingery said. "We wanted to make sure the Phillies saw it. They were all on the same All-Star team at one point, and they were all Phillies." Viza has become an innings-eater in the Phillies system, having thrown more than 126 in each of his last four seasons, while Leftwich is coming off a successful move to the bullpen after posting a 2.70 ERA and 98 strikeouts over 80 innings at Class A Advanced Clearwater last season. The most memorable moment for the program came in 2006 when Ahwatukee traveled to the Little League World Series in Williamsport as the West Region representative. Scott Kingery was the shortstop, playing next to twin brother Sam at second base. Leftwich and Viza were too young for that squad by months but could have been key contributors, according to their coach. The team went 2-1 in Williamsport but was eliminated by tiebreaker in pool play. That would be the high point for most Little League programs, but according to the elder Kingery, it was just the beginning of a golden era for Ahwatukee baseball. Over a three-year span, notable Minor Leaguers Kingery, Leftwich, Viza, Curletta, Cole Tucker, Kevin Cron, Jordan Kipper, Brantley Bell and Colby Woodmansee all played in that one Phoenix neighborhood. Major League slugger C.J. Cron came a few years earlier. There have been hotbeds of baseball talent in the past, but seeing such a high proportion of players go pro is astonishing. The kids, of course, had some help. Leftwich's father, Phil, has 202 innings of Major League experience. Bell's dad is 18-year Major League vet Jay Bell. The Crons had their father, Chris, who won 1,127 games as a Minor League manager. But they also had each other to challenge. "They've always had a decent team, but never like that one time," Tom Kingery said. "It just happened to be the kids were all passionate. They just happened to have the same passion, and the parents, they had baseball in their blood. It was a new up-and-coming development, so it wasn't an old neighborhood. Younger families were moving in and growing together. I don't know if that had something to do with it. But that was a span that had some really good kids come through the league." Scott Kingery could turn out to be the most talented player to come through Ahwautukee, but sometimes it didn't seem like he was the best in his own family. "Scott was always a better hitter, but Sam was better defensively," Tom Kingery said. "He had great footwork and all that. The Little League season, they were 4-foot-9, 79 pounds. Small. But they were fast. Both of them were great at running bases. They were great contact hitters, even back then, and they had power. They hit more home runs than most of the other kids." Even after they filled out some, their lack of size kept big-time college recruiters away from the Kingery boys at Mountain Pointe High School. Pro scouts didn't even bother with the middle infielders. The only solid offer for both Scott and Sam came from Central Arizona Junior College. Scott instead fought for a walk-on role at the University of Arizona in 2013 and went on to hit .398 in his junior year before going to the Phils in the second round of the 2015 Draft. He's since grown out of his Wildcat approach of keeping the ball on the ground and has started to focus on getting it in the air, leading to last year's power breakout. Sam went to Northern Arizona University on an academic scholarship, though he did get tryouts with the University of Arizona and the D-backs before hanging up the cleats for good. That one twin didn't quite get the same shake still irks their father. "I don't know if he could make it," Tom said. "You don't know on anybody. I don't know if Scott will make it. But could he play with these guys here in the Minors? Yeah." 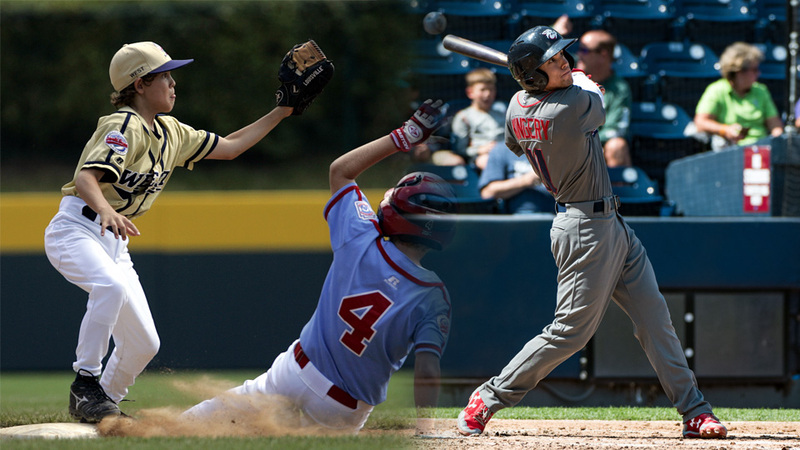 For now, there's one Kingery banging on the door to the Majors while the rest of the family watches from afar. But there are still times when the coach catches his players -- even those who've climbed to impressive heights -- reminiscing about the times when making the junior high and high school teams seemed like a daunting task. "They still talk about it," he said. "They talk about it as fondly as they do any type of baseball they've played beyond that point. Scott's experiencing other memories, but the other kids who stopped after high school or college, Little League is still what they'll bring up. We had the 10-year anniversary and the Little League wanted the kids to come back and every one of them did. They were so thrilled to be part of it."